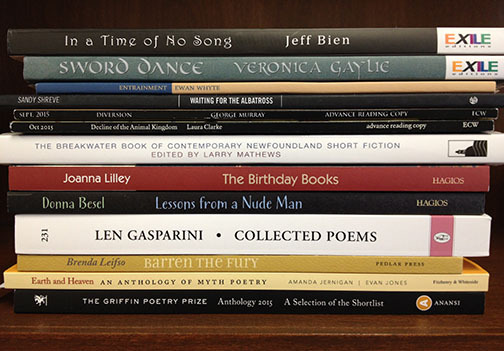 Fiddlehead poetry editor Ian LeTourneau and local Fredericton poet Lynn Davies were on CBC Fredericton's Information Morning last Friday, July 8 to give their summer reading recommendations. You can listen to the podcast here. What do you plan on reading this summer? Read something recently you'd like to recommend? Let us know in the comments! Here's a picture of the recent books received at the office. What are you most looking forward to reading? Tell us! Go to the comment field below (or to Facebook or Twitter) and tell us what you're most looking forward to reading! Books Received — What are you Looking Forward to Read? Here is a picture of the recent books received at the office. What are you most looking forward to reading? Tell us! Read more about Books Received — What are you Looking Forward to Read? Books Received — What are You Excited to Read? Read more about Books Received — What are You Excited to Read? I listen to CBC radio quite a bit, mostly because I can’t pay for cable, and I have run through all my DVDs, namely, a four-season box set of A Haunting and some bootlegged Harry Potters with burnt-in Greek subtitles. The CBC, as I am sure you know, has some terrific programmes and personalities (Eleanor Wachtel, especially). There are, too, these somewhat bizarre features, interviews with pseudo-scientist types whose main goal, it seems, is to shame the Younger Generation. Read more about Celebrating Young Literary Ladies! As promised during the Radio Fiddlehead podcast, here is a list of my ten favorite poetry collections published in Britain and Ireland over the past decade (in no particular order). This isn't pretending to be a "Best Of" list by any means, so if you're reading this and notice something's missing, feel free to fill in my blanks. This is “a” Top 10, not “the” Top 10 — on another day, other collections may have come more forcefully to mind. Poetry is like that. The list is in order by title, not by rank.